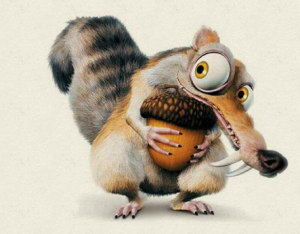 Nuts are big time winners in the paleosphere, or at least bigger than I would expect. I mean – they do have their naysayers (like myself) – but they have big time champions, too. Nuts are probably the most popular paleo snack, and they are also often used in flours (like almond flour) for baking paleo treats. At paleo fx, somewhere in the neighborhood of 30% of my calories came from nuts, given all the paleo treats and protein bars I snarfed between book signings. I am one of the few people who says ‘no’ to nuts. Of course – occasionally, sure. Have a nut here or there. (I’d happily say the same of ice cream or even bread.) I mean, THESE have nuts, so I won’t cut them out completely. They are, after all, dense sources of vitamins like vitamin E and selenium. They also, in some studies at least, appear to reduce inflammation rather than increase it. So they may not be all that bad. Still, the wisest thing to do is to err on the side of caution, as over-doing it can be seriously detrimental. nuts are often cooked in high omega-6 poly-unsatured seed oil. Keep your eyes on ingredient labels. If the nuts in question aren’t labeled “raw” they are most likely cooked in some oil or another, and I can almost guarantee you it will be an unhealthy one like peanut oil, soybean oil, canola oil, corn oil.. These are all omega-6 seed oils, which are highly inflammatory in the body, even in small doses. Here is an example of a raw nut that would be a better choice, if you do plan to eat them. While being processed, nuts are heated to a dangerous degree. If “fried,” “baked” or “roasted” in seed oil, the potential for harm skyrockets even higher, as heating these oils (and the nuts themselves!) to high temperatures rancidizes them, creates oxidative damage in the body, and is a surefire, powerful method of inflaming the body. If “dry roasted,” – which means they’re not prepared in an oil – still be wary! Heating nuts to any degree will rancidize them. Even without the added toxic potential of seed oils, nuts themselves are composed of omega-6 oils and will become extra inflammatory when exposed to elevated temperatures. 2) If raw, nuts still have high omega 6 profiles. As you can see, Macadamias are innocent, which is why they are the only nuts I recommend people eat, and Cashews and Hazlenuts are okay. Other than these few exceptions, however, the omega 6 content is extraordinarily high. 10 grams of fat is the amount of fat in one “serving” of oil… so 1/4 cup of walnuts has just as much omega 6 in it as a whole tablespoon of soybean oil, and enough your body needs for more than a week. That is a lot of omega 6 fat. Consider this math: your omega 6: omega 3 ratio should be no more than 4:1, and probably more like 2:1. If you ate one handful of walnuts which means you consumed somewhere between 5 and 9 grams of of omega 6, you’d have to eat one whole pound of salmon, herring, sardines, or mackerel to make up for it. Moreover – it is incredibly important to keep your total omega 6 and 3 content low. Balance is certainly important. But the balance should be kept to a fairly minimal level. In the above scenario, you’d consume 18 whole grams of these PUFAs. That’s an extraordinarily high number. It is much more ideal to keep a daily intake to less than 3 percent of total calories. For a 2000 calorie diet, this is no more than 4 grams a day. 3) If raw, nuts are still potent sources of phytoestrogens. Phytoestrogens are molecules from plants that resemble the body’s natural estrogen, but do not quite match it. This means that they sit at estrogen receptor sites. Sometimes they increase estrogenic activity – depending on the type of estrogen receptor present in this kind of tissue, say, in this case, the skin – and sometimes they increase it, like in the ovaries. 4) If raw, nuts are still very high in insoluble fiber. There are two kinds of fiber: soluble fiber and insoluble fiber. Soluble fiber is digested by gut flora and used as nutrients for your body. Insoluble fiber is completely indigestible. Having some insoluble fiber in the diet is important. This helps keep digestion moving along smoothly. Nevertheless, if you struggle with inflammation, acne, autoimmunity, leaky gut, Chron’s or Diverticulitis, or impaired digestive comfort in any way, nuts can exacerbate the problem. They are roughage. They can scrub the inside of your intestines like a wire brush. 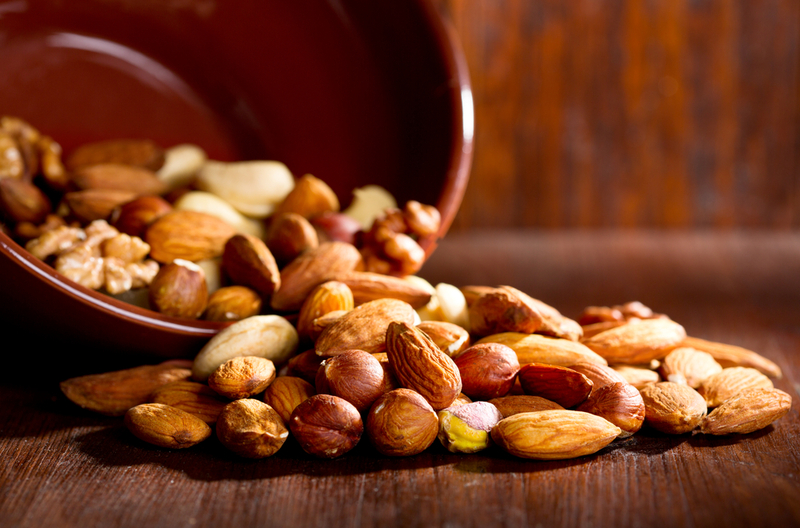 Tread carefully around nuts if your gut or skin health is an issue. 5) No matter what, nuts are very high in calories. I am not a “calorie counter” by any means – but I do know that it’s important to keep calorie intake relatively normal and constant in order to maintain a healthy weight. This can be hard to do when nuts are so dense in calories. One package of macadamia nuts from my local market Meijer, for example, contains 1400 calories. There are not very many nuts in that package! Like six. Okay, I’m exaggerating, but you get the point. You could eat half of the package before you ever knew it, and that would be enough calories for one whole big meal! 6) No matter what, people tend to eat too many of them. Yet the fact that they are usually unhealthfully processed, coupled with their high calorie content and status at paleo-snack-of-choice and flour-of-choice, means that they get way overeaten. There are lots of better snack choices. Fresh fruit and veggies, bars like these or these, a handful of chocolate chips or even gummies made with this gelatin. In the paleosphere, we spend more time justifying why we eat nuts than seems reasonable to me. Other foods are not hard to justify. Meats, bacon, seafood, vegetables, fruit. These rockstars are all easy to evaluate: “awesome!” We do a lot of backbending for nuts that I find unnecessary. Sure, eat some, as in all foods, but they’re not the best. Your immune system, skin, hormones, and waistline may thank you. As I think I state pretty clearly in the article, omega 6 are healthy in very small doses – nothing like the high amounts people consume in the Standard American Diet or even on a few handfuls of nuts every day. + coconut butter is much more tasty than any other nut butter! Um, I know you mean well, but this makes me want to cry. I have been Paleo (nearly W30) for 3.5 years now, and still regularly battle fierce acne breakouts that I have been struggling BIG TIME to pinpoint. And hey, I eat quite a lot of nuts. Raw, unsalted, etc, but sometimes it’s a LOT: easy calories. I SUPPOSE I’d rather have a clear face than unlimited handfuls of cashews, but…dang! In all honesty, though, I do thank you for sharing this, as I have never seen anything besides “hey, guys, just don’t go crazy on the nuts” – I’ve seen no detail on consequences like you’re laying out here. If this is the final acne causer I need to eliminate, I’ll be kissing your feet! I think it’s so ironic that walnuts have been hailed as a great source of omega-3! The omega-3 form in walnuts is probably ALA, the less-absorbable kind too. 80% of almonds are produced in drought ridden California. 1.5 gallons of water are required to produce ONE ALMOND. What are the credentials in nutritional science of the author. I do not question the information but would like to know whence it comes. Some peer reviewed sources would be appreciated. I had just read this post the other day, and then after supper we were still a little hungry so I opened up a bag of roasted salted pistachios. And before I knew it, the bag was gone… I haven’t been buying a lot of nuts recently because of the omega 6 content so in one sense it is good that the bag of nuts is gone but then I did see they were roasted in soy bean oil which I have been trying really hard at keeping any soy products out of the house. Nuts are sneaky. I’m constantly wavering back and forth with them. One week I’ll banish them and the next I’ll be tell myself I can have a handful. Then my digestive issues surface and I break out into a rash. Thanks for reconfirming what my body is telling me! But my question is, where do you get enough magnesium? I thought almonds would be great for it… I have strong PMS and some other hormone imbalance and i know that mangesium is here also very important. Find myself agreeing about packet nuts. But still love my organic almond butter and abc butter (almond, Brazil and cashew). I’m new to this whole paleosphere but I have to say, seeing as walnuts topped your leaderboard for omega 6s, that freshly shelled, locally grown walnuts are just fantastic! I feel supremely good eating maybe up to 6-8 whole nuts, or a good number sprinkled on a salad. We very often have this with a fresh fish meal. Delicious and satisfying. I am so glad I found your site! I have been on Paleo for 6 months and detoxed sugar, gluten and dairy for about 2 months. What I didn’t realize was that I am way too low on carbs (but that comment is for another post!). I am also dealing with MAJOR hormonal acne. I know this because of where it is located on my face and how I have been feeling lately. Anyhow, I am eliminating nuts to help fix this. I have two questions: Can I eat almond flour in baking recipes and can I eat roasted sunflower seeds? Thank you so much! Roasted sunflower seeds would be just. As bad as they’re high in omega 6 and the roasting will make the oils even more inflammatory. What if you are a vegan and don’t want to eat animal products like beef and bacon? I know this is a paleo site, but I have a problem with this article. The alternative you suggest isn’t practical for many, not to mention that meat production in this country is completely unsustainable! What’s going to happen in 50 years when we start seeing a beef shortage? Then where will we turn for omega-3s and omega-6s? What would you recommend as an alternative for paleo baking? @Kelsey there’s plenty of alternatives, like coconut butter, coconut flour, flax seeds, chia seeds. You don’t have to eat nuts to be vegan. You didn’t mention the phytic acid and lectins contained in nuts which prevent absorption of minerals, not to mention the fact they’re high in oxalates which can be a problem for those with gut disorders, as well as being histamine liberators causing an allergic response. Nuts really aren’t very good at all!